CH. Brookwood's Dream Dancer, SOM, LOM "Danny"
Once in a breeder's life comes the dog that you've been waiting for, working for, hoping for, and dreaming for. For me, that dog was CH. Brookwood's Dream Dancer. Danny started his puppy career as the Reserve 6 - 9 mos puppy at the 2000 ABC Futurity in the capable hands of Kimberly Pastella. Shown in a very limited capacity, he returned to the 2001 ABC, winning the Open Fawn Class and was finished three weeks later by Kenneth Andrake. In the summer of 2002, Danny met handler and best friend, Mel Holloman, and the rest is history. Danny won a Best In Show 3 months later and multiple BISS and Group wins. 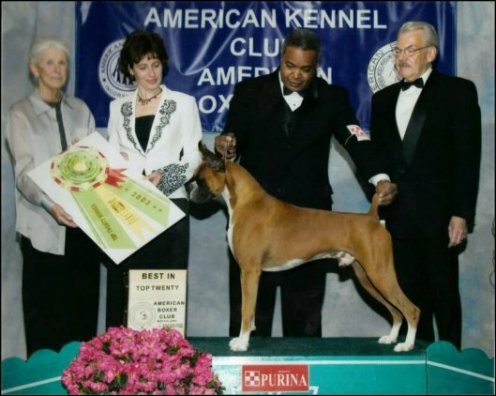 Danny received an Award of Merit at the 2003 Westminster KC Show. We are very proud to be here and would like to give a special thanks to Mel Holloman for helping Danny "take our breaths away". Our congratulations to all the Top Twenty contenders.